My Mind Wanders...: Smokey turns 65! That's right, the big guy of fire protection himself, Smokey Bear, turns Sixty-five on Sat. The year 1944 saw the birth of what has to be, one heck of a successful ad campaign. In a recent study, 95% of those surveyed could finish the sentence when given the first words. Wow! 95% is awesome. How about you out there, do you remember what smokey would say in those commercials where all the woodland animals were in the background, homeless after a fire burned away the forest? How'd ya do? Need the rest? 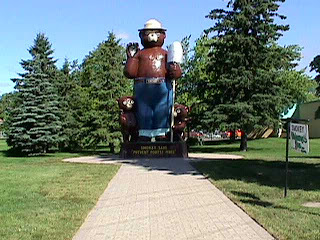 If you happen to be in or around International Falls, MN this weekend, stop by the visit Smokey Bear Park and get your pic taken with this guy...26 ft tall Smokey. 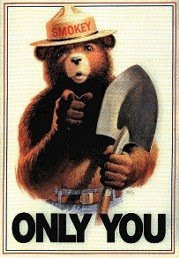 Oh, I luv Smokey Bear!!! Definitely 'forest fires' is the better phrase. That's how I learned it. Yep, Hooty, I definitely remember him, too. And his voice was so deep! I loved him and Hooty! 'Forest fires' is much better. Yay, another vote for forest fires!! Wildfires? Geesh. Haven't they ever heard of branding? It will always be "forest fires" with me. Alanna brings up a good point. I don't think we can prevent wildfires. And Serena, I'd forgotten about ol' Hooty. Yep, good ole Hooty, I still find myself muttering the saying when I see people pitching stuff from their car windows!